Happy Throwback Thursday loyal readers! Today we highlight an article describing an experimental approach by DFG to help curb losses to the abalone industry. The experiment called for DFG to partner with commercial fisherman to supplement feed to the sea otter populations off the coasts of Monterey and San Luis Obispo counties. 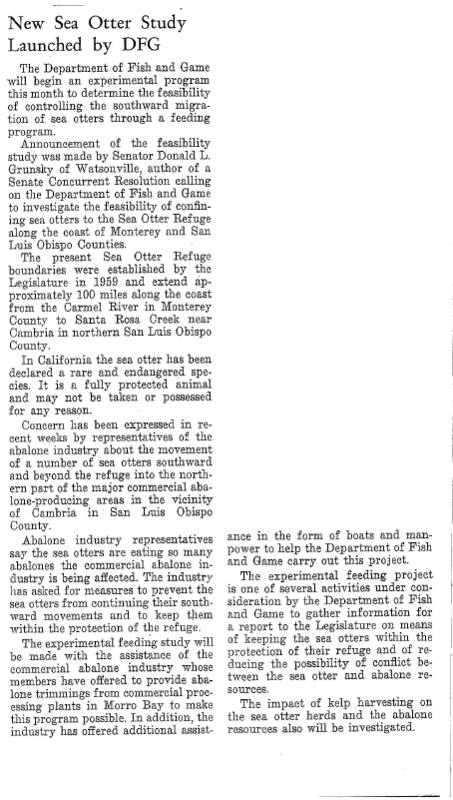 The goal in mind was to make the sea otter’s southern migration unnecessary to help boost abalone production. Quite an interesting approach that, to this author’s knowledge, was ineffective. This excerpted page originally appeared in the 1967 November-December issue of Outdoor California.